Top 10: Most Unique Mega Man Robot Masters! From Strange To One of A Kind! 1: Cut Man Who can deny that this scissor weilding robot master who quite literally wears his weapon of choice on his head is a unique boss, luckily his simple patterns make him the easiest master in Mega Man 1! 2: Wood Man He might not look strange, but attacking and defeating robots with leaves is a rather strange ability and in Wood Man's case it's quite effective! 3: Top Man Using a top in battle usually isn't very effective, that is unless you are Top Man, his erratic moves and patterns make him quite challenging in Mega Man 3! 4: Toad Man Most frogs would be a piece of cake for the likes of Mega Man, but Toad Man is an odd looking master who also happens to be quite tough! 5: Gravity Man Having the power to reverse gravity makes this boss from Mega Man 5 one of the most difficult robot masters up to that point in the series! 6: Centaur Man Is he a man, a horse, or a robot? Nobody knows, but he is one unusual robot master! 7: Junk Man This master of garbage itself is one gross customer who uses waste to attack Mega Man in Mega Man 7 and is a fairly unpredictable boss! 8: Clown Man This trickster is a real nuisance in Mega Man 8 and he quite literally has many tricks up his sleeve. He is quite a clown. 9: Splash Woman Splash Woman is the only female robot master in the entire Mega Man series which makes her an obvious choice for this list. She is quite a tough underwater robot master to boot. 10: Strike Man Strike Man is the first sports themed robot master in the series and he can be quite unpredictable on the hard difficulty setting in Mega Man 10, however on easy mode he is a cakewalk! What do you think of this top 10 feature? Let us know in our comments. 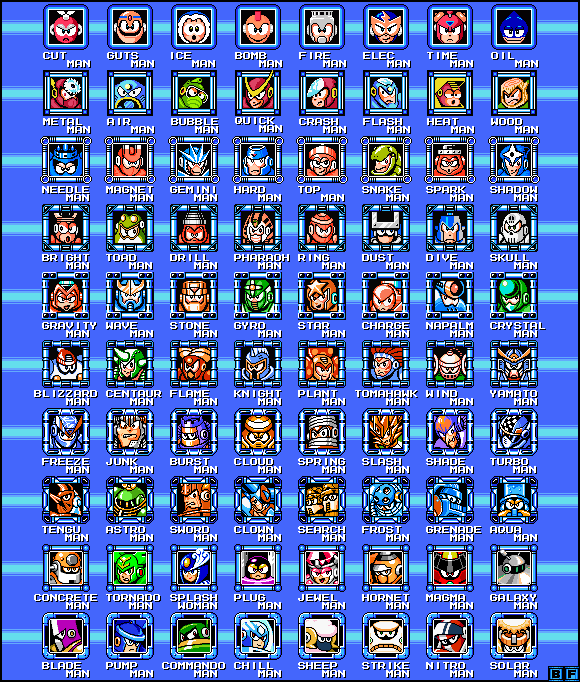 Re: Top 10: Most Unique Mega Man Robot Masters! Good list, but Sheep Man should have made the list. Great list and a fun read. I have to disagree with Toad Man being tough though he is one of the easiest robot master in the series. Shouldn't Splash Woman be classified as a Robot Mistress, since she's Splasn Woman and mistress is the female version of master?